Welcome to The Killdevils online! Chris Monti and Jacob Haller are Providence, RI-based musicians who have been playing together in a variety of bands (blues, hip-hop, afro-beat, rock & roll, you name it!) since 2002. Their blues-inflected music has been compared to Paul Geremia, Arlo Guthrie, and Greg Brown and described as fresh, catchy, and quirky. 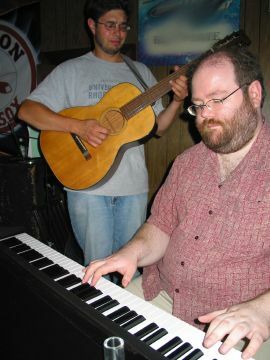 These days, they perform both as the original acoustic duo and as an electric band, with Matt McLaren on drums and Jack Hanlon on upright bass.